CONVECTION: room heating by a convection heater: heat is distributed in a fluid by convection. As the fluid near the heat source warms up it expands, gets less dense, and rises. The rising fluid is replaced by cooler fluid, which in turn warms and rises. As the rising warm fluid moves away from the heat source it cools down, becomes denser, and descends. Eventually, a convection current is set up. In this animation, the heat source is an electric heating coil that glows red at lower right. 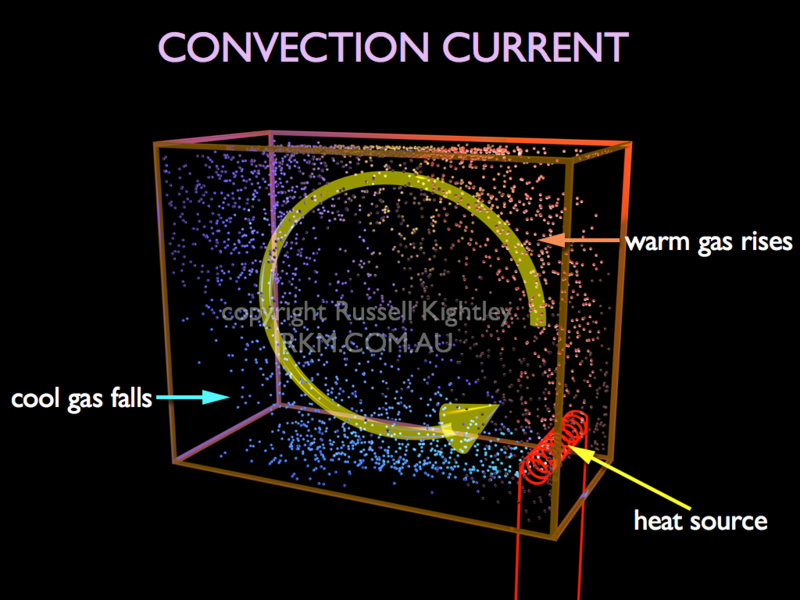 Click here to licence a high resolution still of this convection current graphic. Like air being heated in a house, the heater causes an updraft, and the warm air collects just below the ceiling, before falling at the far wall. Notice how there is also a random movement of the air as well as the circular bulk flow convection current, all of which helps heat to spread around the room. In real room heaters, a fan is often used to help spread the heat (fan forced convection). The same principle is at work in fan forced convection ovens.